Running the New York City Marathon is a serious feat. For those at the New York Road Runners, running the marathon means managing the logistics of the event—and requires just as much stamina as those who pound the pavement. While most sporting events take place in one venue, the marathon’s venue is the five boroughs of New York City. The Road Runners team relies on well-coordinated partnerships with city, state, and federal agencies to manage the streets, bridges and parks where the marathon takes place. The Road Runners and other agencies also plan for safety issues including medical, nutrition and hydration needs, direct an estimated 12,000 volunteers, respond to hundreds of media requests and communicate with more than 50,000 participating runners. “Planning for next year’s marathon starts on race day of the prior year and is really a year-round process,” said Jim Heim, senior vice president of event development and production for the Road Runners and technical director of the marathon. At that first meeting, officials debrief the execution of the event and the year-long planning process leading up to it. Then, they pull in partner agencies to discuss next steps. The Citywide Event Coordination and Management Office brings together all stakeholders involved by resolving any problems prior to and during the race. That work involves connecting an agency with the right point of contact or facilitating the towing of a vehicle that may have broken down along the route. The Department of Parks and Recreation is one of those key city agencies that helps to plan the marathon, as the route passes parks in each borough and culminates in Central Park. Anthony Sama, the Parks director of special events, has been working the marathon for nine years now, and what’s surprised him most is the manpower behind the race. “The sheer number of people involved to make the marathon run as smoothly as it does was really eye-opening for me,” said Sama. The Parks team starts planning with the Road Runners in mid-August, when officials review production schedules and site plans to understand red flags and discuss projects that might conflict with park activities. “With that intel, we map out what changes need to be made and discuss new initiatives we’d like to introduce for the next year,” said Heim. Considering the marathon happens annually, though, only small tweaks were in place to streamline Sunday’s event, according to Sama. 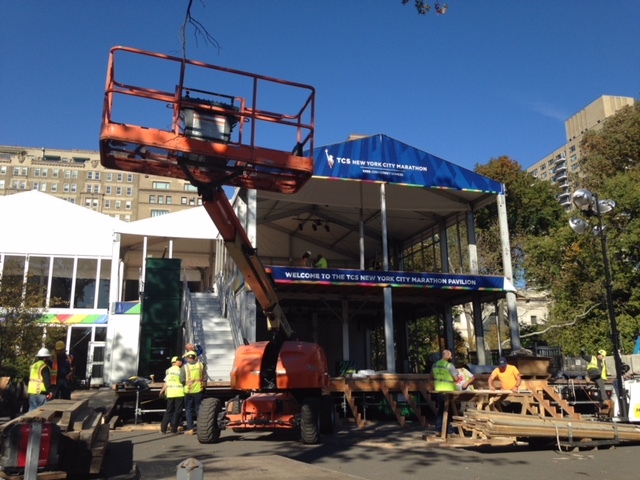 One major priority was managing pedestrian traffic around the Central Park site on and before race day, during the construction of the marathon pavilion, bleachers, and two bridges for pedestrians and media over West Drive. The Parks Department works closely with the Central Park Conservancy, which initially conducts extensive reviews of all proposed plans and then ensures that the route is ready for the event: Landscapes prepared, maintenance staff in place, and trash collection set up. On Sunday, Sama’s direct reports oversaw Central Park, while park operational staff supervised the other parks along the route. Each year, some staff are stationed in the Race Command Center to relay to Sama important information about delays, emergencies, and feedback that the event is going smoothly. In turn, Sama communicates those updates to other staff. Behind the Scenes of the NYC Marathon is a project of the NYCity News Service, a student-powered service at the CUNY Graduate School of Journalism. Copyright © 2019 Behind the Scenes . All Rights Reserved.